Newly remodeled unit just made available for rentals. This was our home in the 70's and now our vacation home. We want you to enjoy old Hawaii the way we did when we were first married. This is a quiet get away from the hustle of Waikiki but can be reached in under an hour by taking a beautiful scenic drive along the beach and through the tunnels to the 'City' side on the island. Life is slower here. 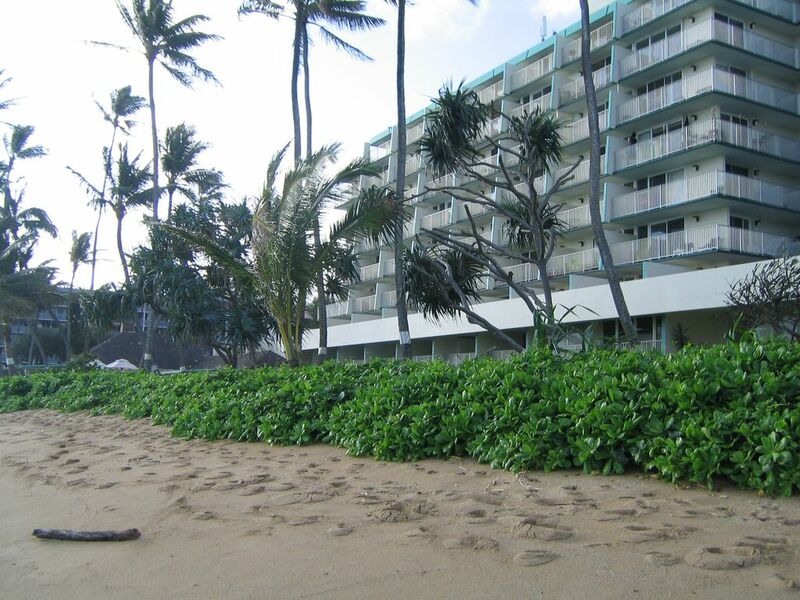 Take a stroll on a beach right in front of the unit and never see more than a hand-full of people for miles. We furnished the unit for us to enjoy, not as a rental. You will feel that you are in your own home on the beach. Everything that you need is here, and our property manager is available at a moments notice if you should ever desire any services. Large private unit, a True One Bedroom, not a studio, don't be fooled by other listings. Over 200 sq ft private lanai on the beach and air-conditioning. GREAT BEDS!!! Great Kitchen!!! Great Vacation!!! We are both teachers who moved to the mainland and stayed to raise our family. Now we return to our 'HOME' on the beach twice a year or more to return to the slow pace of the country for rest and relaxation. We completely remodeled the whole unit from bare walls to make it comfortable. Luckily our unit is on the third floor with a large patio on the beach and is the only floor that can install full unit sized air-conditioning. After living in the mainland my wife, the native Hawaiian needs to have air-conditioning. I always enjoy the tropical breezes that rush through the unit from the ocean, but she's the boss. Either way you will be very comfortable. You are in the country, Old Hawaii, away from the fast pace of the City, but only 45 minutes away if you need to find entertainment other than being on one of Oahu's best swimming beaches. You could throw a ball into the ocean, and the beach has great sand to just kick back. Gaint swimming sandy beach extends for miles without crowds. Split unit, very quiet, not in window type. Just like central air. Only available on 3rd floor with large lanis. Front loader. High efficiency unit. In unit. Front loader. High Efficiency unit. Everything is brand new and top of the line. Two flat screens. Both with DVD players. Largest usable lanai in the complex available for rent. Right below the unit, but in 20 more steps you are on the beach with miles of protected swimming. Good location for exploring the eastern and north side of Oahu. The property is a bit tired and the floors and oven could use a good cleaning. The rooms are a good size (except for the bathroom) and the bed was very comfortable. The kitchen and linen closet are well stocked. The property manager was very accommodating. Refrigerator smelled like fish so bad, everything we put in it came out smelling. Ran out of garbage bags, coffee pot still had coffee in it from previous renters. Previous guest must have had fish that did not get cleaned up sufficiently. Baking powder boxes are being replaced to help absorb any lingering odors in the future. Supply of bags must not have been sufficient for duration of stay that is why property manager leaves contact phone number. Guest would have been helped with these concerns if property manager was contacted. Guest still rated unit a 4 star so there has to be alot of good to counter this negative comment. We will work to make sure we do better. Wonderful Views on the Ocean! We had a great time staying at this condo! Wonderful views right on the beach. The location is really great. With the cool breezes when the balcony door is open, you really do not need the air conditioner on all of the time. Condo was well stocked and felt big. Nice sized master bedroom. Parking was not a problem for us. Only suggestion is to put drapes or blinds on the living room patio door. Although it is dark enough at night that sleeping in that room was really no problem. Paul is quick to respond if you have any issues. Beautiful condo and a great area to see the locals. Also it is located not far from either the Polynesian Cultural Center or the Kualoa Ranch. This is a wonderful peaceful retreat! Older property but inline with other properties in the area. Would definitely return. Manager prompt and helpful. Loved our extended Hawaii vacation at Pat's at Punaluu Unit #315. We extended our vacation after doing the Cruise around the islands. This was a great transition after being in a cruise cabin for a week! Large unit with updated kitchen and bath area, comfortable king size bed, and beautiful ocean views. Although the wall obstructed the view during breakfast coffee, the grassy area right by the water more than made up for it. Loved the closeness to all the activities of the North Shore! Even though there are not many restaurants close-by, the area does have options. And the beaches are absolutely awesome! Nothing like seeing mountains out your front door, and the ocean from the back balcony! One suggestion I would make would be to change the check-out time to 10:00. The main site shows it as 11:00, but the check-out directions state 10:00. We really enjoyed our stay! Phillip’s place had everything we needed! The beds were super comfortable, the kitchen had lots of plates, glasses, silverware, and pots/pans. It was so nice to have the beach right at our doorstep! My only wish is that there was curtains in the living room to block the sun from coming in in the morning so we could have slept a little later. Other than that tiny hiccup, everything was lovely and we’d definitely come again! Aloha and mahalo Phillip! Also, Paul, the property manager, was there to greet us and let us in to the condo. He was very nice and a phone call away if we needed anything! Thanks for the kind words, would love to have you back. Give me a call and we will make your return trip even better. Very Close to Polynesian Culture Center and other North Shore attractions. A Hawaii Hotel Tax of 14.962% will be included with all rentals. Hawaii Tax ID: W0225318-01. Hawaii Property Manager- Paul Comeau 808-293-8124.